One Out of Every Four Children Has a Vision Problem Interfering With Their Learning. Vision is all about the way our brains and eyes interact. Whether it’s reading words on the board, catching a ball, or tying our shoelaces, we depend on our visual system to work properly in order to succeed at any of these tasks. This is because vision isn’t just what we see, it’s how we interpret and interact with that information. In fact, you can have perfect visual acuity―able to rattle off all the symbols on the reading chart―but still struggle with dyslexia, poor focus, hand-eye coordination, or vision conditions like strabismus, amblyopia, or convergence insufficiency. In other words, Vision Therapy retrains the brain to more effectively interact with the eyes and therefore improve vision functioning. The goal is to enhance eye tracking, focusing and eye teaming abilities as well as eye-hand coordination and visual processing speed. Each patients therapy will focus on the areas that they need improvement on, at their own pace. Vision Therapy is similar to physical therapy in that the program depends a lot on the progress of the patient. Normally the length of a program will range between 4-10 months and will require in office visits either once or twice per week. In addition to the office training the patient will be expected to do 15 minutes of exercises daily at home. It is important that people perform these visual skills efficiently and accurately in order to interact optimally with their surroundings. Vision therapy helps to improve, and sometimes teach or re-teach, these visual skills. Vision therapy is a custom tailored program that trains the brain and the eyes to work together when processing information. While glasses and contacts compensate for a vision problem, Vision Therapy teaches the patient's visual system to auto correct. Doctor supervised Vision Therapy programs have been shown to be extremely effective across many studies. Your Belmont Developmental Optometrist can help with lazy eye (amblyopia), eye turns (strabismus), traumatic brain injury (concussion, whiplash) and special needs populations. Research has shown that 20% of children have a vision issue that affects their learning. Amblyopia, commonly referred to as “lazy eye” is when there is a significant difference in power between the eyes. This is often, but not always, caused by an alignment or eye-teaming problem such as strabismus. Amblyopia or “lazy eye” is best treated by Vision Therapy. First, the source of the amblyopia must be identified. When indicated, eyeglasses are prescribed. Many eye doctors, particularly Pediatric Ophthalmologists, begin treatment by patching the "bad" eye. However, patching is now proven to be ineffective! Likewise, some doctors recommend atropine eye drops. However, this addresses the symptoms and not the neuro-optometric cause itself. 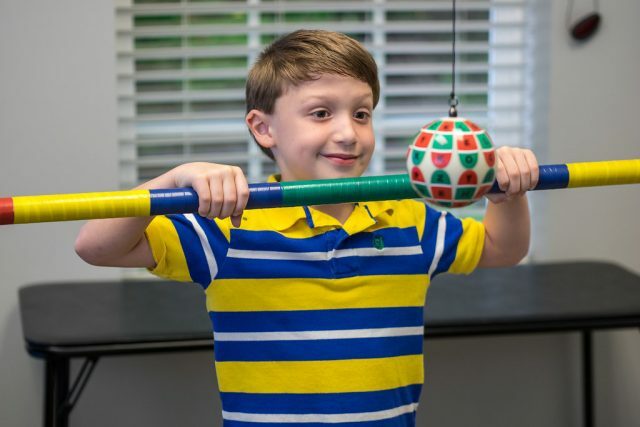 The developmental approach taken by Vision Therapists realizes that amblyopia is really not an eye problem, but rather a problem of not being able to use the two eyes together as a team (eye-teaming). This approach is therefore often much more successful. In the same way that it was difficult for a parent to identify if someone had the problem, to begin with, it is often difficult for them to know if an eye doctor's recommendation to patch the eye is really working. They, therefore, may be losing time with an ineffective outdated treatment plan. Amblyopia does not go away on its own, and it can significantly affect a child’s ability to both learn and thrive socially in school. Untreated amblyopia can lead to permanent visual problems and poor depth perception. To prevent this and to give your child the best vision possible, amblyopia should be treated early by vision therapy. Strabismus, often referred to as “Crossed Eyes”, “Wandering Eyes”, or “Wall Eye” is a condition where the eyes fail to properly align. Beyond the social stigma, strabismus often results in other vision and visual processing problems such as diplopia (double-vision), amblyopia, and problems with depth perception. A major concern for developmental optometrists is that strabismus is not as simple to diagnose as a visual check. In fact, you can have strabismus without any obvious crossing or eye turn. Eye muscle surgery can sometimes make the eyes appear to others as if it is straight, but it rarely aligns with the other eye, and the amblyopia continues. A program of Vision Therapy for children or adults, is usually needed in order to restore visual function and the ability to use the two eyes together as a team. A study of almost 700 5th and 6th graders indicated that convergence insufficiency is much more common than many assumed with 13% of students having CI, as well as demonstrating that of the children who showed three signs of CI, 79% were classified as being accommodative insufficient as well. Eye coordination problems such as convergence insufficiency and convergence excess generally cannot be improved with eyeglasses or surgery. Likewise, research demonstrates that the traditional focus exercise often called "pencil pushups" are ineffective. The only consistently effective treatment for convergence insufficiency is office-based Vision Therapy, which will improve eye coordination abilities and reduce symptoms and discomfort when doing close work. What Visual Dysfunctions Contribute To Learning Related Vision Problems? There are 9 primary visual skills that are used when reading, many of them are not natural processes but rather require that a child learns the skill in order to read well. Even Just One Of These Signs Or Symptoms Can Indicate That You Or Your Child Has An Undetected Vision Problem. Vision and learning are intimately connected. Someone may have a learning problem that is caused by an underlying vision problem. 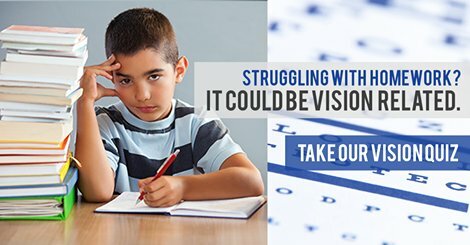 A child with a vision problem can be misdiagnosed as having Learning Disabilities, ADHD, or Dyslexia. There are various reasons for this misdiagnosis. For example, children who have learning-related visual problems cannot sustain their close work at school or home, showing signs of Inattention or Hyperactivity. 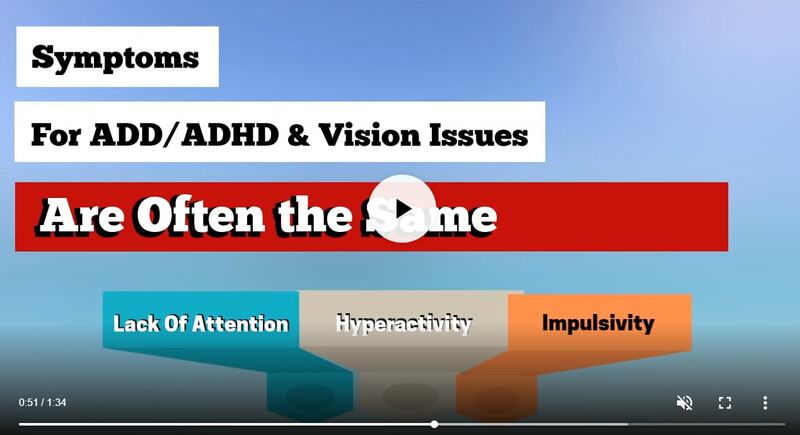 A child may be misdiagnosed as ADD or ADHD because children with ADHD also can't sustain attention on their work, and inattention and hyperactivity are the two of the three main symptoms for the diagnosis. Same behaviors, different diagnosis. It is common for children who have Learning Disabilities to have vision problems that contribute to these learning problems. Vision Therapy does not correct learning disabilities, but correcting the underlying vision problems through Vision Therapy often solves many of the obstacles that make learning more difficult than it need be. Call our Vision Therapy Clinic in Belmont for more information. There is no consensus on the official definition of dyslexia. Often referred to as a “learning disorder”, dyslexia is typified with difficulty reading or interpreting symbols in the correct order or syntax despite the sufferer having at least average intelligence. "Dys" means "not". "Lex" means "read". Dyslexia therefore literally means not being able to read. A substantial number of individuals with dyslexia actually have other visual problems that make the problem greater. All too often, an undiagnosed vision problem is the reason the individual was diagnosed as having Dyslexia to begin with. If a vision problem affects learning, it can sometimes be misidentified as dyslexia because there are similarities between the two. 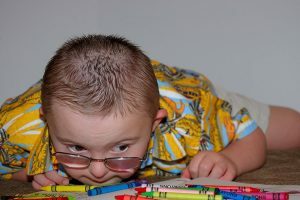 Behavioral and Developmental Optometrists in Belmont have the knowledge and experience to diagnose and treat vision disorders that masquerade as Dyslexia or contribute to the unique challenges presented by Dyslexia. However, Vision Therapy does not treat Dyslexia itself. Attention Deficit Disorder (ADD) is a widespread problem. If a child has a short attention span, the common assumption is that the child has ADD and should be on medication. If a child has behavior problems, then the assumption is that they have ADHD, Attention Deficit Hyperactivity Disorder. At times, an underlying vision problem further complicates matters. Addressing the vision problems reduces the symptoms of ADD and sometimes eliminates them entirely. If a child has difficulty pointing their eyes in to read material (convergence), if they can’t physically focus (as you would focus a camera), or if they can’t sustain those activities, that then makes it difficult for the individual to maintain attention. More energy is needed for the visual system and there is then less energy to concentrate on reading. This then leads to a short attention span. If someone can’t physically maintain concentrating for whatever reason, they may be then labeled ADD. A child who cannot focus because of a vision problem will not be able to sit still and do as instructed. Furthermore, child with these kinds of vision problems is not able to point their eyes and focus within the amount of time needed to complete assigned tasks and homework. In this case, medication will not be effective. As the child develops the visual ability to correctly physically focus their eyes, they are then better able to attend and concentrate, maintaining their mental focus for llonger periods. They are then able to complete their work. Before a diagnosis of ADD/ADHD is made, (or even once it has been made) and medications prescribed, parents and teachers should first consider a comprehensive eye examination with our developmental optometrists for their children. Much is at stake in the event of a misdiagnosis. A brain injury such as a concussion will often disrupt the visual process that interfere with how information is taken in and processed. Vision can be also be compromised as a result of a neurological disorder such as a stroke, a brain tumor or Multiple Sclerosis. These are termed Acquired Brain Injuries. When someone has a Traumatic Brain Injury (for example a car crash or a bad fall) or an Acquired Brain Injury (stroke or brain tumor), it is common to then have problems with vision. Making sense of what you see is one of the most important brain functions. Your Belmont Neuro-Optometrists help individuals solve the vision problems brought about by that brain injury. Addressing the vision problem often facilitates improvement with other therapies. Neuro-Optometrists diagnose and treat in order to maximize the patient's outcome, with the ultimate goal of these services to improve the patient's quality of life. These visual issues affect how someone is able to function on a daily basis. Addressing these vision conditions to the recovery process. In fact, patients typically gain more from neuro-developmental vision therapy than they do from other therapies, such as occupational therapy, physical therapy, or cognitive therapy, etc. Vision issues such as the ones listed above are all too often the main obstacle in achieving a full recovery. When someone has a Traumatic Brain Injury (for example a car crash or a bad fall) or an Acquired Brain Injury (stroke or brain tumor), it is common to then have problems with vision. Making sense of what you see is one of the most important brain functions. Your North Carolina Neuro-Optometrists help individuals solve the vision problems brought about by that brain injury. Addressing the vision problem often facilitates improvement with other therapies. Neuro-Optometrists diagnose and treat in order to maximize the patient's outcome, with the ultimate goal of these services to improve the patient's quality of life. These visual issues affect how someone is able to function on a daily basis. Addressing these vision conditions to the recovery process. In fact, patients typically gain more from neuro-developmental vision therapy than they do from other therapies, such as occupational therapy, physical therapy, or cognitive therapy, etc. Vision issues such as the ones listed above are all too often the main obstacle to achieving a full recovery. Our optometrist, provides cutting-edge sports vision training to athletes from Belmont, Charlotte, Gastonia, Rock Hill. No. There is no age limit because of the brain’s neuroplasticity. Our brains are dynamic and flexible. Just like a muscle or playing an instrument, the more we practice and hone our ability and memory, the more skillful we become. Children's brains are more malleable than adults, and for this reason, it was assumed that children will have better results with Vision Therapy. While true, adults possess a strong motivation to make the treatment plan a success, and we treat patients of all ages. It uses progressive vision exercises performed under the supervision of your eye care provider. Each set of exercises is tailored to meet the individual visual needs of a patient. These exercises are done 1-2 times per week in sessions lasting 45 minutes to 1 hour. The exercises are designed to continue until visual processing problems show improvement. As much as 80% of all learning for children occurs through vision. Problems with any of the above components of vision can lead to difficulties with learning. Children with visual based learning problems are often misidentified as lazy, slow, or having ADD/ADHD. A developmental eye exam is necessary before starting vision therapy . Following the exam, our developmental optometrist will determine whether or not you or your child requires vision therapy. Is there scientific evidence that Vision Therapy really works? It can be a useful tool for helping children and adults alike. Children with learning or reading problems can benefit from the vision boost these exercises provide. Eyeglasses are not the solution when the problem is visual processing. These problems can’t be detected without tests done by an eye doctor. Adults can see vision improvement through this therapy as well. It can help curb eye-strain related vision processing problems brought on by working with computers all day. Many vision problems do not require surgery for correction. In these situations, vision therapy is typically an option. Vision therapy can be done close to home, in Charlotte, and is a form of physical therapy used on the eyes and brain. It is designed to resolve vision problems that can contribute to learning disabilities. This therapy can also be used as an effective treatment for problems like lazy eye, crossed eyes, or double vision. 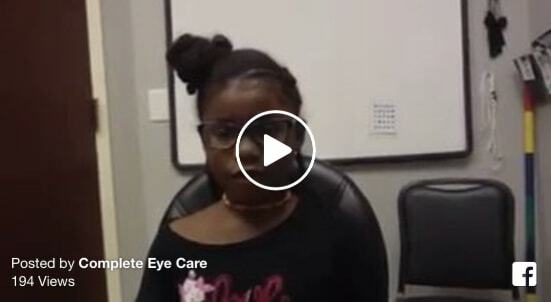 Our Vision Therapist, Janet, talks about her approach to vision therapy for adults and children. Traumatic Brain Injury or TBI is a common cause of vision loss. 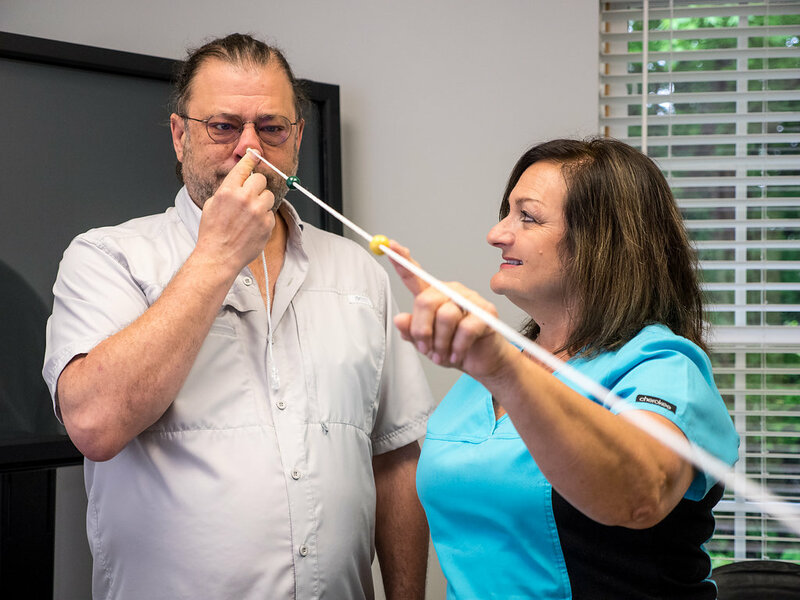 If you are experiencing symptoms of vision loss or reduced vision due to a head injury such as concussions or whiplash from a car accident, our Doctor led Vision Therapy program may be able to help you. 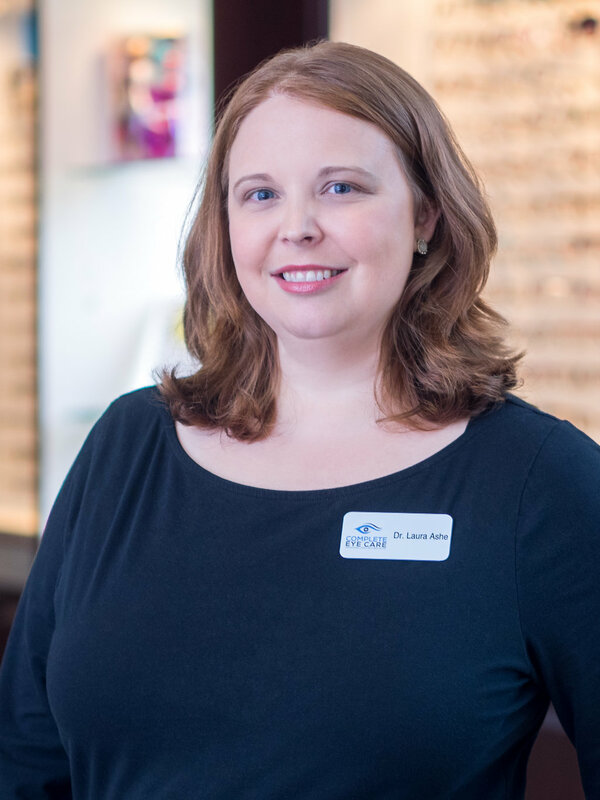 Visit our vision therapy center serving Charlotte, NC and meet our vision therapist Liz Compton. Double vision is an extremely common eye condition that in many cases is treated with prisms and vision therapy. Because double vision affects one's ability to drive, it is recommended to schedule a comprehensive double vision eye exam with a vision therapy optometrist.